Please be advised that the IESO has now closed procurement for both microFIT and FIT programs. As of December 1, 2017 Halton Hills Hydro will no longer be accepting applications to these programs. Any applications that were received before this date have been or will be processed. Customers interested in connecting generation to the distribution system are encouraged to review the Net Metering program requirements contained in our Guidelines for Applicants Connecting Distributed Generation and contact our Engineering Department at 519-853-3700 Ext. 213 or generation@haltonhillshydro.com. Generation Connected in Halton Hills: 5447.7kW as of January 16, 2018. The Green Energy and Economy Act, 2009 has introduced new Feed in Tariff (FIT) programs managed by the Independent Electricity System Operator (IESO). These programs will allow generation facilities using a renewable source to generate power and sell that power back to the grid. These programs are designed to encourage and facilitate a greater use of renewable resources such as solar, wind, water, and biomass for generating electricity. Such generating projects would be connected into a local utilities distribution system. In taking part in the Independent Electricity System Operator’s Feed in Tariff Programs, you will be able to generate electricity using an environmentally friendly source and be paid for the electricity you generate a special rates set by the IESO. The IESO has set specific rates based on the method of generation and the amount of electricity you supply back into the utilities distribution system. What is a Renewable Project? There are two separate programs with slightly different rules and requirements based on the size of the generation facility. To be eligible for the FIT program the project must have a gross nameplate capacity of no more than 10,000kW. Projects eligible for the microFIT program must have a gross nameplate capacity of no more than 10kW. Must be connected to an eligible electricity distribution system voltage in Ontario of 50kV or less. Apply to the IESO and receive approval from the IESO to enter into a contract to take part in the microFIT or FIT programs as applicable. Have a separate meter suitable for data collection and settlement purposes. The process for connecting a generation project to the distribution system differs for microFIT and FIT projects. The process for connection of microFIT project is fairly straight forward and not overly intensive. The process for connection a FIT project is much more intensive in that additional studies (Connection Impact Assessments) and commissioning tests are required as part of the process prior to connection. The following link will provide you with an overview of the connection process for microFIT and FIT projects. We encourage those interested in participating in either program to review our “Guidelines for Applicants Connecting Distributed Generation” for further details. Recent Changes made by the IESO to the microFIT program require all new microFIT projects be screened for available capacity for applications submitted on or after December 8, 2010. The IESO will ask all microFIT applicants to obtain an Offer to Connect from their respective LDC prior to issuing a conditional microFIT contract. Please see our processes for connection, connection guidelines and application forms at the following link for details. On April 9, 2010, the Independent Electricity System Operator (“IESO”) informed distributors that Measurement Canada had indicated that it “will not recognize or support” the in-series metering configuration as described in the IESO’s MicroFIT rules. Measurement Canada’s concerns would also apply to contracts under the FIT program. The IESO’s discussions with Measurement Canada have not resulted in a resolution to this matter. Given that distributors must comply with Measurement Canada’s laws, regulations and requirements regarding metering, and given Measurement Canada’s current assessment that it will not support in series configurations, the Ontario Energy Board has determined that distributors shall not connect any indirect in series configurations to their distribution system under the MicroFIT or FIT programs. The IESO has also reflected this on their website. On April 5, 2012 the Independent Electricity System Operator (“IESO”) informed distributors of relocation options for microFIT applicants who had submitted an application to the IESO before December 8, 2010 and received a Conditional Offer that had not expired as of August 19, 2011. These applicants would have also requested an Offer to Connect form their LDC but were informed by their LDC that connection capacity was not available. Please see the following link for information from the IESO. 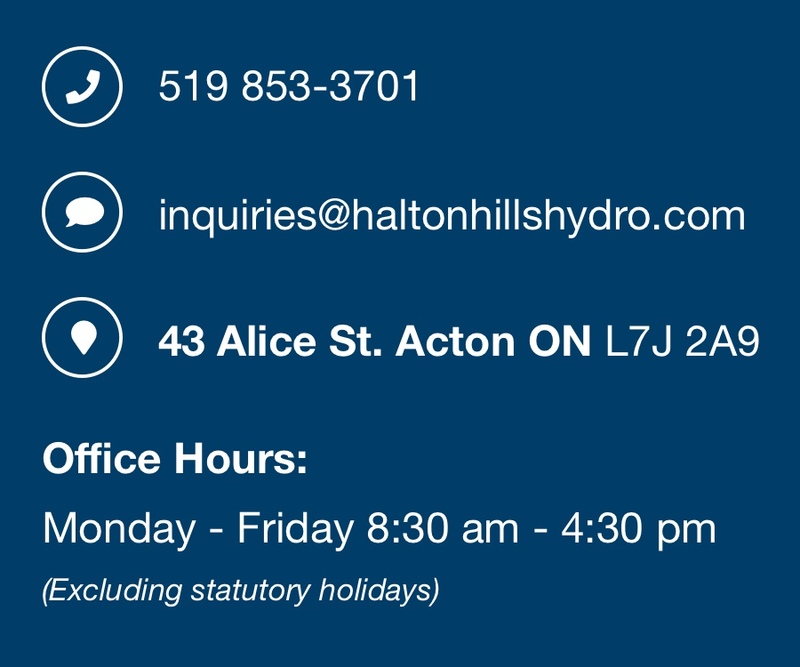 If you are interested in connecting a renewable generation project to Halton Hills Hydro’s distribution system please contact us via email at generation@haltonhillshydro.com or by phone at 519-853-3700 Ext. 222 or 905-453-2222 Ext. 222 for more information. Also, visit the Independent Electricity System Operator and the Ontario Energy Board for additional microFIT and FIT related information.